About the Layer Art Project.. Layer art is fun to make and I wanted to experiment to see what I could do with the software that makes it, see if it fits in with my usual editor’s line-up. So far, it’s nice but lacks many of the primary editing tools I’ve come to rely on. There are some great qualities, like the layer art effects. I haven’t seen the pathways it takes to create this kind of art before. I appreciate the ease of use and would consider buying this software. This series will be available for sale as prints on canvas, archival paper, acrylic, metal and more. Visit Fine Art America store for more about prices and options. Layer Art Limited.. This is a limited project as the software I use to create the layer art is a trial that will expire soon. I used the free trial of Corel Paintshop Pro X6 to create my layer art. What Is Layer Art? Layer art is art that is layered with colors and shapes giving a topography look to the art. I used a free trial of Corel Paintshop Pro X6 to create the layer art, by choosing a combination of settings, I get a wonderful topography look. When applied to the appropriate layout, preferably a simple portrait or minimalist landscape, I get a fantastic layering effect with a differential of color light and shape. I will stick with this technique until my Corel Paintshop Pro X6 trial is over, thus creating a limited series. Corel Pro doesn’t have the sizing and print options I prefer but when using it to size for print, I get a smaller file with lots more pixels. I miss the print preview and wonder if I am doing it all right. My choices for CMYK are confusing, I would like to go back and forth from RGB to CMYK easily and at will. 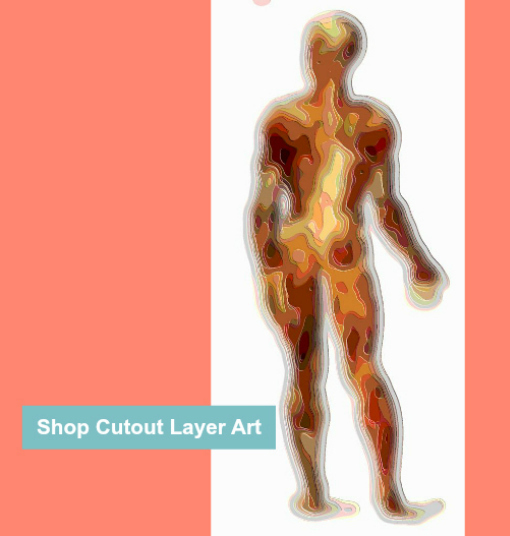 Shop the Layer Art Collection at Fine Art America. Most of the layer art is for sale as art prints on canvas, archival paper, metal and acrylic.